Show and tell... I tell you a little about me and show you something cool related to what I told you! It has been a sad week around here, my great aunt passed away on monday and it really got me thinking- thinking about family and how important it is to me. I'm not just talking about my close family, I'm talking about cousins and distant cousins, aunts and uncles. It got me thinking that I would love, one day, to bring my kids to meet all of my cousins, aunts and uncles who all live overseas. And most importantly, I'd love for them to meet my dad and grandmother. I also realized, that as much as I love the idea of moving away to New York or Japan or where ever, I don't like the idea of being far from my mom and sister and I would be sad if my kids didn't get to play with their cousins. All this to say, family is and always has been important to me wether they are near or far, they are always in my thoughts and heart. So today, I thought it would be nice to share with you a family owned buisness- where mother and daughters work together in perfect harmony to bring us and our kids the cutest, coolest Robots ever: EBK Robots. Jen: Robot whisperer and lover of rainbows. Becky: Robot maker, boogie shaker and kickin' grandma—don't mess with her! Sara: head Robot guru and design ninja master. Ellie, Jonah, Nathan, Evan: Robot Testers + Grilled Cheese eating machines. 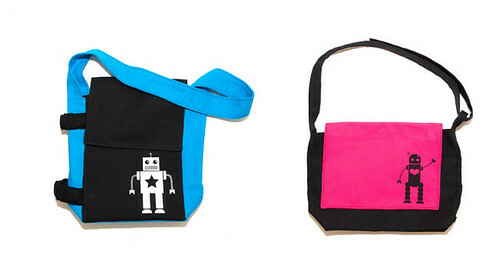 All the products, robot pluhes and bags are handmade in the US with lots of care and love. Mister M is the proud owner of the blue Robot bag you see above and carries it everywhere. I can't believe we've had it for almost 2 years and it looks as good as new. What's great about the EBK robots, is that they are suitable not only for the boys but for the girls too- they come in all the colors of the rainbow and they make formreally great gifts too, for any age really. I'd love to adopt a family of little robots, wouldn't you? Now is your chance, get 25% off with code SPRING at checkout- offer is available until sunday March 7th.